Felt ok today but want to save it for potential track sessions this weekend. I drove down to the big soccer field where corner to corner is ~170 meters. Pretty sure I'll be utilizing this for many quality, short sessions this year. It's a new field and still super soft which means less pounding. The goal today was relaxed and fast working on some mechanics. One idea is that you don't work on top speed form while running at top speed. You work on it while running at a more moderate speed. ~25 degrees, too cold to not run bundled up so movement felt blah. My gym is a few blocks from here so I sat in the dry sauna for 30:00 post run and did deep tissue/ scraping on my legs. I woke up feeling good considering yesterday's intensity. HRV was good but not great like it was yesterday (7 point drop today), so I chose a tempo session. Something less intense. Sunday was a 7 mile run with one of my athletes. Yesterday I felt drained and flat, so it was a rest day. 3 X 300 meters on 6:00 rest. All three were the fastest I've ever run a 300. The first two were ~90-95% efforts holding back a tiny bit. The last one I admit to pushing to near best effort, still started relaxed though. My previous fastest 300 in a workout was a 41.6 a couple of weeks before I ran my 55.9 400 race last year. Thursday was a cycling workout on the trainer. 3 x 40" max efforts (cadence 90+) on 2:00 rest. Friday was 4 X 40 meters. Felt horrible. Today. Track. Speed endurance or 90%-95% effort. My legs are lit up today so I took the speed option on my schedule. Yesterday was a 3 mile easy run, which is something new to my schedule and something I have been against for my own training. I'm making this up as I go though and I constantly doubt my planning ability for my own training. Not uncommon. It's why I have a job. Anyway, this morning was a lift with my son and he's embraced my #2 rule for the weight room, which is never skip leg day, so he wanted to focus on legs. We did a bunch of hops and jumps, med ball movements, isometric squats, and light Smith rack squats. I use the Smith rack with him so it's more controlled and I can cue him on posture and position, same reason for the isometrics. Right now I'm not concerned with lack of need for stabilization, more just technique and form. The jumps and med ball are for stability. My #1 rule by the way is to never touch your face. Gyms are petri dishes. 4 X 30 meter downhill, fly. No times. On 4:00 rest. Then 3 X 100 meters on a very slight down grade. 3 point start. I'll just be using a 3 point start for my 400's this year. Not much of a need for me to use blocks for a 400. I timed these which is far from accurate but I think if they are wrong then I'm at least consistently the same amount of wrong. Downhill, yes. But easily the smoothest and strongest I've felt in a long time. Traveled Friday so I took a zero. 2 X 10 16" box jumps. 2 X 10 24" box jumps. 2 X 50 double leg hops (imaginary jump rope) holding 12# kettle bells. 2 X 50 hops w/ 18# kettle bells. 2 X 20 hops w/ 24# kettle bells. 2 X 10 16" box jumps with 24# KB. 2 X 20 each leg TRX bulgarian split squat jumps. THESE are amazing and an excellent finisher. Then I went into a comprehensive routine with a secondary focus on eccentric hamstring and glute work. Today, Sunday. I wanted a hard speed endurance session but I really didn't want to drive 45:00 to the track. So I measured out 300 meters on a section of road by my house. I don't have anything flat, and by "anything" I truly mean that there isn't a flat section of road within 10 miles of my house. So the 300 meter profile was roughly 100 meters with gentle uphill to start that gradually went to a downhill/ 100 meters downhill (maybe 3% grade)/ 100 meters transition from down to uphill with the last ~50 meters fairly steep. Here's a pic. You can see the final uphill in the distance. If I were at sea level I'd have taken just 1:00 rest between but since this is at 8000+ ft altitude I knew going in that there was no way. As it was the 3:00 left me wanting more, but was just enough. The goal on the 300's was 90%-95% effort. 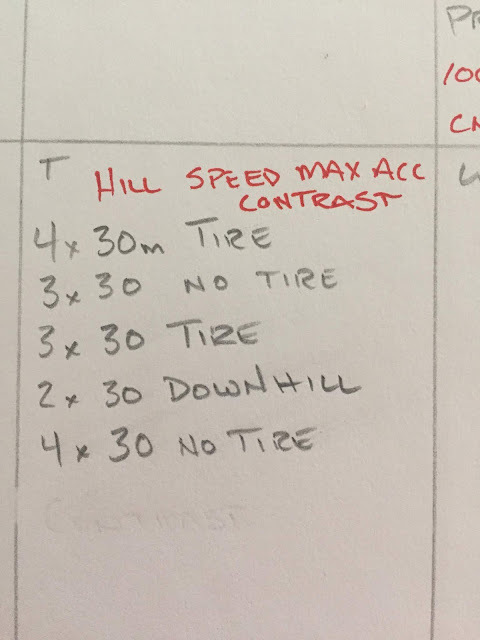 This session is designed to be run on a track at sea level and I have the chart to tell me what times I should hit that correlate to 90-95% of my 200 ability... which all means nothing here. So I went in with zero time goals and just the goal of running "hard" but balanced. Meaning I didn't want to run the first one too hard and then die on the rest of them. Am) Made it down to the track but had to cut the workout short in order to make it home to get my kids ready for school. Just 2 X 300 meters hard. 44.5" and 46". On the slow side. Again I feel great through 200 and then die quick after that. I definitely need to focus on that speed endurance aspect for a month or so. Pm) Since I cut the morning run short and I felt great I did a second session. Sort of speed endurance-ish because of the short and active recoveries. 6 X 30 meters sprint on 270 meter jogging recoveries. At high altitude that simple jog recovery (not walking or standing) after a max effort started to accumulate more fatigue than a typical full recovery. Then 3 X 100 meters sprint on 300 meter jog recovery. In terms of volume for someone focused on the 200 and 400 that would be considered a fairly long run. All told, with the warm-up I got ~3 miles or so total. Like some things, even when it's bad it's good. I got to the track today. They had far less snow in town than we had up here (20"+) in the mountains so it was all clear. The plan was to do something I haven't been able to do as of late. So I chose split 400's done as 300 hard/ 1:00 rest/ 100 hard. Results. 300 in 44.5. Done. I felt great through 200 then over the next 14 seconds I died. I ran one more 300 after my hamstrings loosened from their cramped state but I kept it very relaxed. Then 1 lap with the straights as tempo. So, not what I wanted but I'm not entirely shocked. Over the last several days I've had solid workouts with yesterday being a lift + 5 X 50 meters hills. Thursday was a crap ton of shoveling heavy, wet snow and I wore a 20# weight vest. 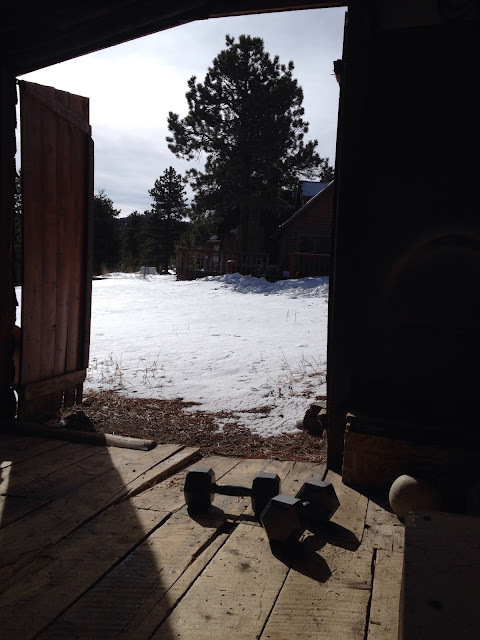 I shoveled the driveway (twice), deck, and a path to my shed and it was one of the harder "workouts" I've done in a while. Plenty of reasons I sucked today but I think the main one is that I haven't done anything long in a while. I need more endurance work but not the long, slow running kind. More the speed endurance kind with reps of 300m up to 400m done at 90% to 95%. Very difficult, long efforts edging upwards to 40"-1:00. Anyway. It's all fine and good, even as I was failing I was having a blast. I tell athletes that the best way to know if a workout was too hard is to wait a day. Or two. Over the years I've learned how to feel if a workout is too hard or damaging while it's happening by paying attention to how my body feels during the workout compared to how it feels the next day. By paying attention in the moment, and then looking back, you learn how to predict. During Monday's workout I stopped at the point where I thought I could be compromising the next day's workout. I was also seeing a drop off in performance which is a sign of break down. Yesterday I lifted early in the morning for ~45:00, lots of jumping and eccentric hamstrings to mitigate my HHT (high hamstring tendinopathy) that has been niggling. As long as I continue to load it heavy, eccentrically and frequently it's fine and good but I dropped off the routine last week and it's flared back up. 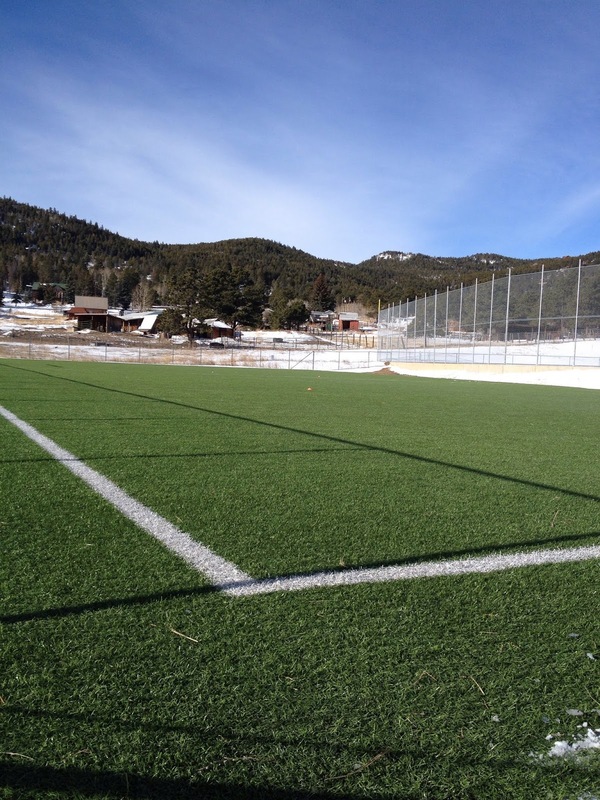 Then late in the day, thank you daylight savings, I went to the soccer field and did a speed session and practiced my starts with 8 X 40 meters. After the first one which was dismal I managed to get the next 7 under 5.8 seconds. Which isn't great but considering my fatigue it's fine. Part of the goal was also to work on my starts which are slowly becoming consistently good with much less thought. I also forced this a little because of the storm that moved in last night and will prevent me from running for at least two days. 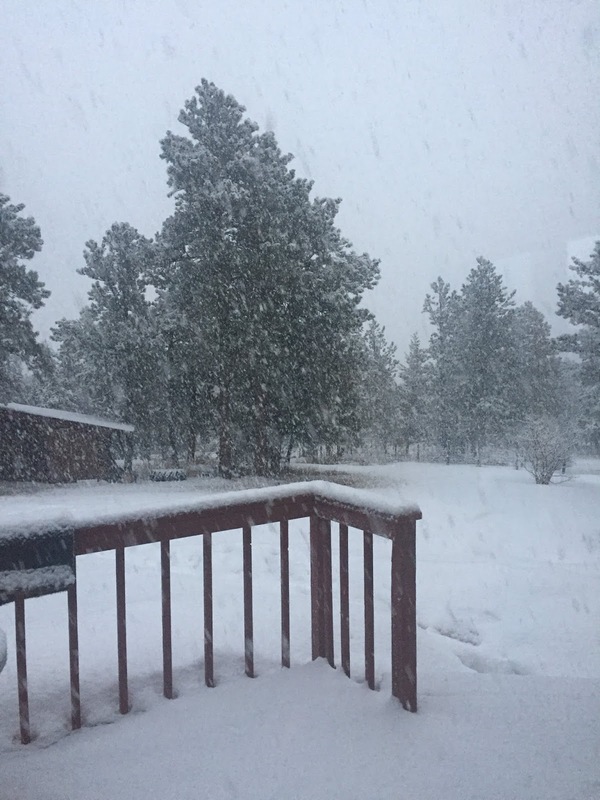 The first few inches of a potential foot of snow. Old Man Winter is grumpy. I haven't posted for a minute but I'm continuing to train fine considering the weather has been less than ideal for sprinting. Today was contrasting uphill/ downhill 100's on (maybe) a 2% grade. These were broken up into sets of two (also called split 200's) with a 1:00 to 2:00 rest between each. Then 6:00 to 8:00 rest between sets. I'm finding that the typical one minute rest between split intervals isn't productive at 8000+ ft altitude, I think it only inhibits performance. That 60" rest protocol is based on an assumed sea level altitude with the goal of neural and ATP recovery but still allowing high lactate levels, never a mention of actual O2 uptake. At high altitude though O2 becomes a real issue. After 60" rest I'm gasping for breath and it's actually peaking at that point. Today, between 100's, I waited until I actually caught my breath and was no longer feeling light headed which was coming on after about 1:30. 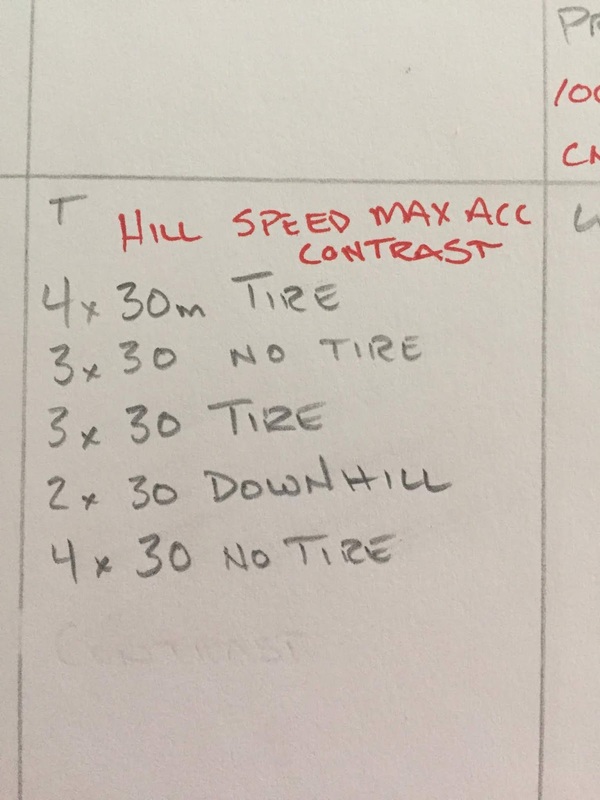 I've never read anything about contrasting up/down hill workouts so I was sort of making it up as I went. My idea today was to use the downhills to allow me to run faster in a fatigued state than I could on a track, not only in terms of the individual 100's but also the volume. 10 X 100 is a ton of sprinting and I was hoping the downhill would allow me to eek out more reps. So I ran my first 100 UPhill/ rested 1:00 up to 2:00/ then ran a 100 DOWNhill. The first 100 was an aggressive but relaxed effort, no time goal. The downhills were just max effort, no time goal. One other reason for this workout was that I don't have access to a flat 100 meters unless I drive an hour round trip. The first two were still sort of warming up and getting a feel for the hill. Not sure if this is an effective workout or not. I'll find out in a few months, but of course one workout has little impact on overall performance. It was fine though and I had fun. However, I am sure that the downhills allowed me to run more total meters faster than I could have on a track. I averaged 13.0 seconds for 10 X 100 (or 26" for 5 X 200 meters, not really but sort of) which I doubt I would be able to do otherwise. I'm also not rested, previous workouts have been solid so doing this well in a fatigued state is quite good for me. One thing to note is that downhill sprinting is as violent as it comes. I've read that pushing downhill sprints too aggressively is a "potentially career ending" exercise. I've also read that injury rates increase 3600% when fatigue begins to inhibit nervous system economy. So basically downhill sprinting when fatigued increases injury risk by a gazillion percent. It's probably best not to try it. Friday was a great hill workout. Yesterday was a ridiculously solid strength session focused on jumps, loaded jumps, and messing around with some shoulder stuff. I've backed way off on any upper body lifting in the interest of keeping that mass or weight down. I'm consistently at 155-160 pounds regardless but every little bit I don't gain helps. Today I felt really good but could definitely feel some nervous system fatigue but I went to the track anyway because it's the weekend and I won't be able to get on all week because of school. Tired, but not knackered, so I gave it a go. Freezing cold, 28 degrees and a steady ~10-15 mph wind. The turf infield was snow with spots of dry but lane 1 and 2 were dry from someone shoveling. The goal was 3 sets of 3 X 100 on 1:00 rest. Full recovery between sets. I stopped after two sets. Choosing goal times for short intervals is pretty tricky and I've found it more effective to go by perceived effort and percentages. Similar to Daniel's VDOT chart I use a % chart based on various personal bests or current level of fitness. So today I ran at two efforts, 100% for the first ~20 meters and then 95% for the remaining 80 meters. Which is kind of similar to how you'd race a 200. 14.2 no blocks/ curve and I tripped, more on that in a minute. On the curve of that last set I kicked my leg on the swing through, first time that's happened. I'm wondering if that's a sign of the neural fatigue. My times were also meh but I was putting out the effort so I'm guessing that it was. Then I practiced my starts. I still need work but they are getting better. My issue is that I take too big a first step when I need to keep it much shorter. Technically, your leg moves faster because it's not moving as far and also you're not loading that lead leg at a disadvantageous angle (too bent) and losing power on the drive. Similar to the loading disparity between a full squat and 3/4 squat, the 3/4 squat is much higher because you don't break over that more extreme/ weak angle. When I try really hard to explode out, I over step. When I relax and don't try as hard, it's much better and faster. Then I ran one more 100, blocks, in 12.9. Back to the VDOT idea thing and choosing splits. Taking out the trippy 100 this workout indicates that I'm in about 25 high 200 shape. That's very encouraging because today I was quite fatigued and the weather wasn't good for sprinting. Good workout even though the times were mediocre. Being self coached and having no second opinion or source for advice I often doubt whether or not I'm training hard enough. I wonder if all those years of training too hard has made me too cautious. I could have banged out several more 100's in under 14" today but I don't know if I would have been better or worse for it. I think it's prudent to start with caution and work up but I still wonder what level of fatigue is good or bad with sprinting. There's something called autoregulating where you let the watch decide that point. Once you become too fatigued to finish within X% of the goal then you are done. I'm still figuring all this out. Of course time will tell and performance tests are needed which is something I am lacking. Maybe I need more time trials? I do know for sure that I am faster over 40 meters but that's not a good predictor of whether or not my 200 and 400 fitness is progressing, in fact it may indicate that my programming is wrong. 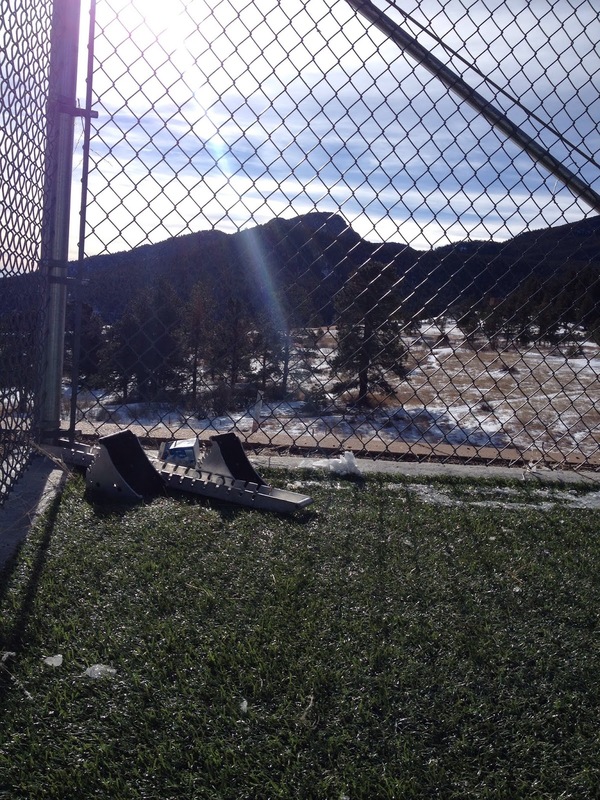 It's also tough to track since I do (now) 95% of all of my training on a hill at 8200ft altitude which doesn't give reliable performance data for a track race. Lot's of questions. But, I am having a blast so that's all that really matters for now. Today was 10 X 9" hill sprints. Deceptively difficult because I was only taking ~1:00-1:30 between each. At 8000+ ft altitude you never really catch up. I started with a comprehensive jump session and then 3 X 30 meter tire pulls. Here are a couple of videos. I couldn't figure out how to upload them to Google (I'm tech challenged) from my iphone but I figured out how to upload them to Twitter and then embed them. 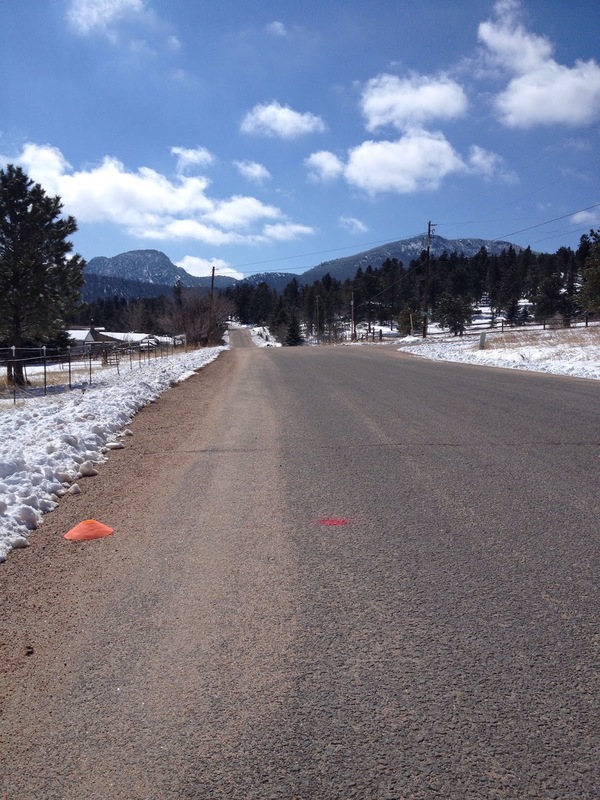 Beautiful day for once and you can see the hill where I do nearly all of my sprint training. Not ideal but I'm making it work. I'm 16 weeks out from my first race of the year which will be the 200 meters. I've kicked around the idea of starting with an 800 meter but in the interest of staying dedicated to the 400 I'm going with the 200. Generally, training for the 800 won't help your 400 but training for the 200 will (it depends a little on where you're coming from in terms of race focus. A marathoner will run a faster 400 if they focus on the 800, but a 200 meter runner probably won't). For a sprinter, the requirements for a fast (sub 2:00 in my case) 800 will more than likely hurt your 400 speed. As with any race, the 400 is defined by energy "systems" or metabolism or fuel. More so than any other race however the sprints require a much higher degree of nervous system economy. Training at much slower paces and higher volume inhibits, and can actually hurt, central nervous system development as it applies to sprinting. If an endurance runner has a poor Vo2 (poor economy of movement) that's OK because other systems can make up for it. But with sprints if your economy is poor there aren't any other energy systems that can compensate to a degree that will make up for it. Also to consider is the duration of the event and what even a small deficiency of movement means. I spent the entire summer last year trying to take a HALF second off my 200, so small changes in economy have a significant impact. 1"-8" you use alactic metabolism. As the duration indicates this is your explosive or immediate movement. You produce/ burn ATP quickly and it runs out fast. You can also call this the ATP-CP system. CP stand for creatine phosphate. Of note, when you focus on this duration you go 100% only and your recovery intervals need to complete. 1:50 up to 1:100 ratio of work to rest. This is true "speed" work. Anything over 8" is not speed work. And I base that off the truest definition of maximal output. I understand that there is "speed" relative to your event. 3"-10" After the initial couple of seconds of explosion you start producing lactate. In the 3"-10" range you can refer to it as power/ short lactic. Energy systems blend into one another so you're rarely in just one. The 400 meters, and to a lesser extent the 200, covers all of these (the ones I'm writing about today) which makes it tricky to train for. If you're weak in one area you won't run fast. 10"-20" Very much lactate, or power/ long lactic. Edges into "speed endurance". 20"-60" Lactate capacity or as I call it, my favorite. Very much speed endurance. This is by far the most painful type of training and also the most (overall) specific to the 400. Intervals are long and hard (95%-100% efforts) with relatively short recovery between reps. A workout example would be 200 meters HARD/ rest 1:00/ 200 meters best effort. Then you would rest ~8:00-12:00 between the next split 400. I read somewhere that blood lactate might only begin to plateau at ~10:00 post interval, so after that second 200 your lactate levels continue to climb for 10 minutes. Brutal. And awesome! 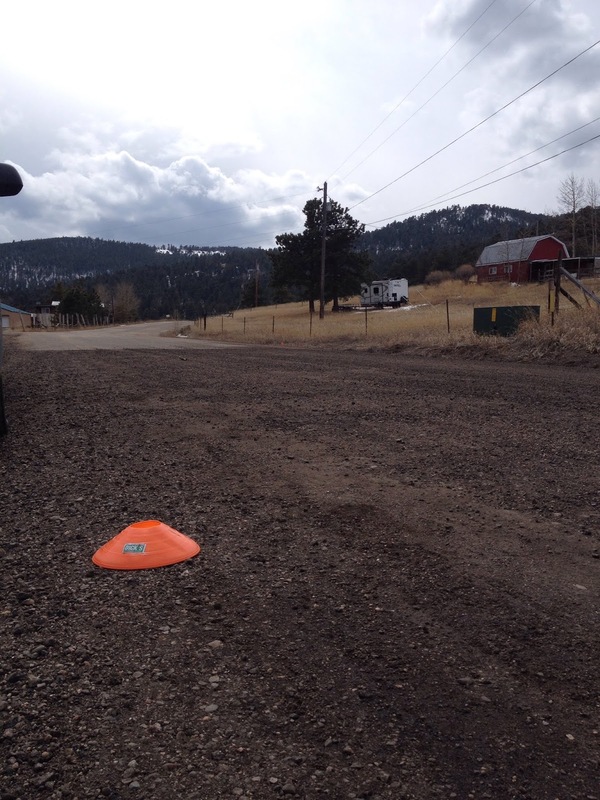 It's also something that endurance athletes could learn a little bit from when doing threshold intervals. You can take more rest than is typically prescribed and when I coach my athletes I tend to write "rest as needed". If you do 5 X 1000 at threshold you can take 1:00 up to 5:00 rest. The more important data point is the speed of the 1000. If you take too little rest then the quality will diminish. Then you go into energy systems based more off Vo2 max or the traditional "endurance" training. Duration ranges from 1 minute up to hours. So, again, I'm 16 weeks out and I'm supposed to be focusing on more general preparation. Long tempo is a key workout but I'm going to take some liberties with this idea. I sort of, in my very limited scope of understanding physiology, disagree with the long tempo for sprinters. For an endurance athlete I feel that the long tempo could be the only workout you do. For a sprinter however I feel it's bordering on harmful to an athlete with a speed weakness. And this is specific to ME as an athlete. My endurance, the type you develop with efforts at 70-75%, is far from my weakness. I've been an endurance athlete for 35 years. I feel that the long tempo is good for an athlete moving up from the 100 to the 400, or for an athlete moving up from the 400 to the 800. But for a guy moving from 100 MILES down to the 200 meters, I don't like it. I feel I'd be much better if instead of a long tempo I'd do speed endurance or speed or max velocity, or a jump workout with plyo which is more my limiter. So no long tempo. Another factor is that I've basically been in a general prep phase for the past 5 months. So how much more do I need? I feel, and have proven, that my ultimate genetic gift is durability. I'm not naturally fast or strong or an endurance monster... but I can train hard enough to make up for those short comings. Part of that durability comes from learning (too many times to count) where my limits are and also having a healthy paranoia for soft tissue injury. Over the decades I've pushed to my limits until I almost broke, then I rested just enough to avoid an injury. It's made me durable. I also have the bone density of James Howlett. So, I think I can handle a higher load than most which means I want to blend my general preparation phase with the next phase which can be called the "specific phase". On that note, it seems that the term "specific training" gets a bad rap. When we communicate amongst ourselves we use terminology to convey our meaning. The word specific indicates training that requires efforts or movements similar to their event. You can assume that a "specific" workout for a sprinter isn't a two hour long run at MAF and that a specific workout for an Ironman isn't 20 meter block starts. I also think the word "specific" indicates something that directly tranfers to your race performance. Loaded back squats are not specific to running. There is a very general or ancillary benefit which can support specific training. But it is not specific and it doesn't directly transfer. If you improve your back squat by 10% that doesn't mean you are now faster. You've gained strength so completely NON-specific to the neural requirements of sprinting that it may make you slower. And if you deep squat you may have compromised the stiffness qualities of your quad tendon which will absolutely make you slower. Enough. So here's my basic week that I'll be using for the next 4 weeks. The way I tend to coach myself is I have a set number of workouts within a week and I do them as I feel. I take different options depending on how I feel. With sprinting and the need to go near max every time there are plenty of unplanned days off. My schedule is just a loose template or guide to each week. There also is no need to change this schedule for 4 weeks. It'll take longer than that just to realize any significant compensation. On any given day I'll shorten or lengthen intervals (within the ranges of specific duration goals) depending on how I feel playing it more by ear. My tendency is to go harder and do more so I don't feel that keeping it fluid hurts me. It's entirely about listening to my body. And on a final note, I didn't put in my strength days. I'll do those before or after the short hill sessions. We spent the weekend back home where it never got above 15 degrees. It's also where they don't plow or clear snow off of anything so the footing sucked. 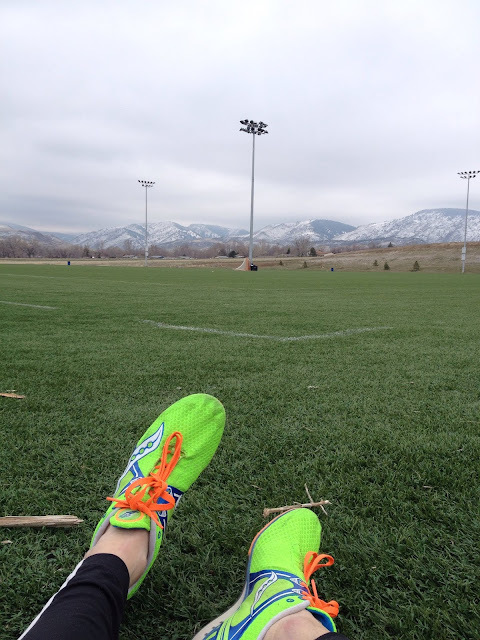 I actually went to the track hoping my spikes would provide enough traction to do a workout but it was a fail. Today it was 18 degrees and snowing when I started my workout and the roads were just wet, not slick. I really don't care about the temperatures, it's entirely about the footing. If I wanted to run easy for miles then it'd be a simple and familiar thing, but trying to run fast on anything but good footing would be careless. Warm-up- Jumping. Lots and lots of jumping. As long as you aren't super fatigued starting a workout, then often times just doing a comprehensive jump/ plyo routine is plenty. And then of course nothing prepares you for running as well as running does so I started with 4 X 50 meters. Everything today was up the steep hill in front of my house. I swept the sand off my starting line and the first 20 meters. 2 X 50 meters max accelerations. Which means race like starts. Since I can't set up my blocks in the road (Yet. I have an idea as to how I can do that once the tarmac thaws) that means 3 point starts. 2 X 50 meter max velocity. Which means flying starts. I took ~40 meters and built to near top end speed and then accelerated at the line and went 100% for 50 meters. All of these were on 3:00 rest. Then 2 X 150 meters. 3 point starts at 100% effort. Pretty brutal intervals. At the 50 meter mark you're still accelerating or just topping out and you feel fine. At 100 you start looking for the finish hoping it comes quick. By 125 you're tying up trying to relax and drive your arms. Super happy to hit 25" low on each. Not sure I've run a 150 that fast on my hill let alone two of them. Rested 8:00 between each. Neurotype- 100 mile to 100 meters. I'm writing this in rambling fashion. I've forgotten all of the stuff I learned when I got my double PhDs in creative writing and physiology from Columbia. Just as I've blocked the most horrifying parts of that time on Hoth when my friend found me unconscious in a blizzard and saved my life by stuffing me inside his gutted Tauntaun. Both of those are equally true. This is more just thoughts on my experiences in training for and racing both ultras, the 100 mile specifically, and sprints and how they differ in terms of neurotransmitters and personality type. My first race back after running 100 miles was 100 meters where I ran 12.8 seconds after stumbling out of the blocks. It was my first time ever using blocks. I've improved a ton so they are no longer a stumbling block. That's sort of a wide range of effort and distance and the disparity goes well beyond the physical. The mental aspect is so different that I wouldn't even classify the two as a similar sport. The mental aspect not only varies from the idea of time and intensity but also from the chemicals involved in the brain. How you think of it and what it requires to sprint and how you feel afterward is very chemically dissimilar. Arousal before the race is even profoundly different with one being a Celine Dion song trying to relax and the other akin to lighting yourself on fire while listening to AC/DC's Thunderstruck. 1A Dopamine Seeking. High acetylcholine. Most neurally powered. Can tolerate the highest intensity loading but does best with the lowest volumes. 1B Dopamine Seeking. Low acetylcholine Also neurally driven, but more explosive than the 1A. More "athletic", where 1A uses brute force to accomplish a task. Many track and field jumpers. 2A Adrenaline Seeking. High GABA. Very outgoing due to a desire for affirmation of others and low social anxiety. Does well with a mix of neural and muscular training. Can be difficult to taper and prepare for high competitions. 2B Adrenaline Seeking Low GABA. More of a "bodybuilder" type. Higher anxiety and reward dependent. Not generally a great athlete, has to work very hard to be good at their sport and is often a more supporting player. Doesn't tolerate a lot of intense neural work well. 3 Serotonin seeking. Overproduces cortisol. High anxiety and seeks predictability. Makes good endurance athletes since this type of work is highly predictable. Doesn't do well with neural work, since they have the weakest nervous system. These neurotypes or personality types are general observations in different athletes and there is no cut and dry rule on each. Although I do feel that our personality types (hormone dominance) do choose our ideal natural discipline. Me for instance. I'm a type 1 yet I did well at Ironman and ultras. I consciously chose those sports but my true happiness always came from intensity. I just happen to be durable enough (from starting strength training from an early age) that I was able to do a crap ton of volume (for the sport), up into the 30-40 hours a week range for years, and mix in a crap ton of intensity which was/ is my type 1 personality showing through, which is similar to a person craving a piece of cake. I crave(d) intensity for a hit a of dopamine which is tougher to obtain on a 5 hour run or bike. A 200 meter sprint is an immediate fix. But it ultimately led to massive under performance in Ironman because of constantly being tired. I suspect I may have been a more natural Olympic distance guy. You can mix, or find a mix of, the various types within an individual but there will always be an underlying preference that indicates the neurotransmitters that we're seeking. As a coacher of athletes for the past 20 years as I learn more about the chemical side of personality I am trying to correlate or classify athletes with this in mind. I have an athlete who over the past 3 years has gone from focusing on 100 milers to wanting to run a fast 5k. He then switched to Ironman and has been able to do massive amounts of volume. Yet this past Saturday ran a solo 16:30 5k time trial on the track. He's always up for and enthusiastic for intensity. He was also a professional golfer which, believe it or not, is very much a type 1 athlete in that it's risk seeking both in the sport itself and as a chosen profession. And if you think about golf from a neural pov it isn't that much different from a sprinter. You line up and need hyper focus for just a few seconds. Then you take (maybe) a risk in your shot and then you're immediately gratified with success. Or that's what you're seeking anyway. Definite Type 1-2 tendencies. His type 3 side comes into play, in my opinion, more from the novelty side of Ironman and also the significant challenge it presents. Ignoring neurotransmitters for the sake of the challenge or discipline is a whole nother blog post in itself. Craving desert (sugar cravings can also be a sign of high cortisol levels) but not allowing it because of the satisfaction of being disciplined is a mobius strip of psychology. Anyway, his recovery and ability to absorb massive volume is very good which isn't necessarily a type 1 trait. He's just as happy banging out 200's on a track as he is riding 6 hours on a trainer. So he's a mix and as his coach I need to be aware of this and recognize that he will thrive more if I don't go by the book with periodization and allow some satisfaction of his underlying cravings. The good thing is that I recognize this and I also see how destructive a durable and motivated athlete can be to themselves. Understanding an athlete's neurotype should not only help to steer their race choices but also steer their periodization. Polarized training for example is a good choice for an athlete who enjoys intensity, or a type 1-2. They may need a long, focused period of Z2 or easy mileage but if they get bored and aren't enjoying it then I say don't do it or at the very least allow some workouts that are "fun" for them. You could also extend this concept over to the workplace and examine the productivity of employees. I guarantee the most productive people are the ones who enjoy their job. I had written a bunch more on this but was going in circles and rambling way off track so I cut it short here. I feel there is real potential in understanding neurotypes and what types of training will yield the best results. If you're interested in learning more from the Master himself then check out Christian Thibaudeau over at T-nation. Like I said, he's a bodybuilder and his perspective is from that view point BUT there is real correlation in runners and endurance athletes. We have the same hormones and neurotransmitters that guide everything we do. On my hill, 3 X 100 meters at max effort. I went in with no goal other than to get maximal stimulation with the minimal number of repeats. To get the most out of the least you have to give each interval 100%. The idea here is based more on the electrical (CNS) rather than the metabolic. Swept the sand off the first 20 meters of road. 3 point starts. Focusing on stomping the ground after the first 20 meters (increased ground force = increased drive) and good arm swing. Head down, chin tucked for the first 20 meters. Good dorsi flexion in my ankles and sweeping back before ground contact. All on 4:00 rest. Probably should have taken more. Hamstrings and glutes started to ache after the third 100. I'm certain that a 4th would have been slower. Maximal stimulation with just 300 meters of running. Perfect. Huge neural demand/ stimulation with minimal metabolic/ hormonal stress = minimal recovery. I have about 5 pages of writing done on a blog post that might be forthcoming. It's a long ramble about personality types in running. Ultrarunners VS sprinters specifically and the chemical/ neurotransmitter differences and how it applies to preferred training and race distances. From the start my legs felt great. Loose, fluid and springy and my rhythm was great. Then when I started the workout I sucked. The loose plan was split 300's of 200 meters aggressive/ 1:00 rest/ 100 meters hard. First 200 in 27.04/ 100 in 14.3. Glutes started to cramp, legs felt like wood. I pushed pretty hard yesterday (and the day before. And the day before that) so I should have expected it. I probably could have banged out 29" 200's for quite a while just by muscling them but I was working harder than I wanted so I bagged it. Ultimately I just wanted to get on a track in nice weather and run fast/ hard so this was a great workout regardless of the fail.